First, facts; yes the GOP won the House, but Democratic House candidates won more of the popular vote than their Republican counterparts. Redistricting or Gerrymandering is what explains this failure of democracy. Dems probably need more than 55% of the popular vote to win the majority in the House. Note also that with a much thinner victory in 2004, Bush actually claimed he had a mandate, and proceeded to try to privatize Social Security, which was eventually a failure (because even the GOP base doesn’t want that). Bush won with a margin of 2.4% of the votes (the second one; the first one was 5 to 4), while Obama won re-election with a 3.8% advantage. Obama had 51% of the vote while Clinton in 1996 had only 49.2% (Perot took votes from the GOP, and the margin of votes over Dole and Perot was just 0.1%; yes 0.1 not 1%!). And some people suggest that if not for the Lewinsky affair Clinton would have privatized Social Security. So if anything this election produced a clear result, not mixed, for Obama and in favor of maintaining social spending and the Keynesian policies stimulating the recovery, with higher taxation on the rich at the top of the agenda. The deficit, as several polls have shown, was not an issue. The only bad thing about the fiscal cliff deal was the increase in payroll taxes. But The Economist has a different view. 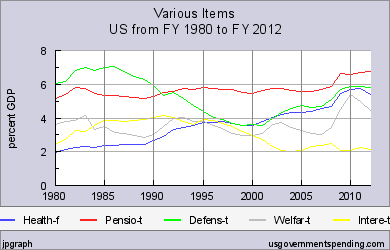 If you believe this Social Security is spending should be ballooning. Hardly the case. See the graph below, with the mains spending categories as a share of GDP (data here). Note that the only that is really increasing throughout the whole period is health spending (blue line). Welfare spending has gone up during the crisis, and interest spending down, and they should reverse in a few years when the recovery is complete (welfare spending is already way down from its peak). Social Security spending too increased a bit, but not much (and is actually in surplus now) since the crisis, and the reason is that people that can’t find jobs and can retire tend to do it. Defense spending has expanded considerably after the two wars, and is the only kind of spending that was not caused by the recession. On health spending note, however, that the countries that spend less, and have as good health outcomes as the US or even better, are those with a public health option. At any rate, note that this notion that the US has an entitlement problem is bogus, as much as Obama’s narrow victory and need for a compromise. If anything he fell short of his promises and should had delivered a long term solution for health spending, i.e. the public option. Awesome. The truth is that, I was trying on running a blog about this idea today. You’ve prodded me to improve my personal line of reasoning.